Egg, sausage, black pudding, bacon, Heinz Baked Beans, toast, tea (Twinings English Breakfast, milk, one sugar). 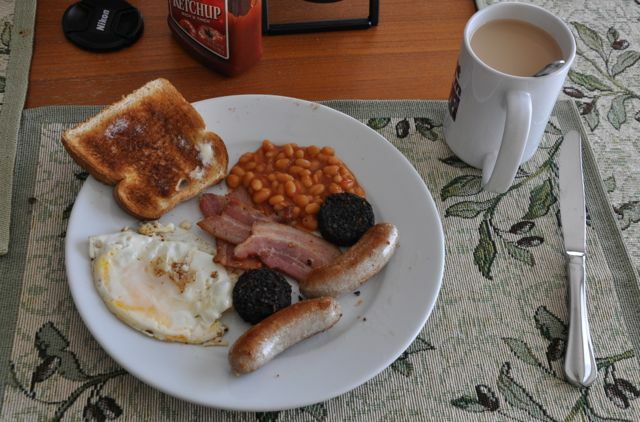 The sausage, beans, and black pudding came from a trip to Global Foods to get the proper stuff from England, the bacon is a "bacon steak" from the grocery store. I had a full English breakfast in a little cafe in Battle, when we went to England years ago. My family was a little startled I ordered it, since I rarely eat more than a slice of toast for breakfast, but who could resist?